Hi Y’all, sorry that’s my attempt at being folksy. I’m not even from the south. 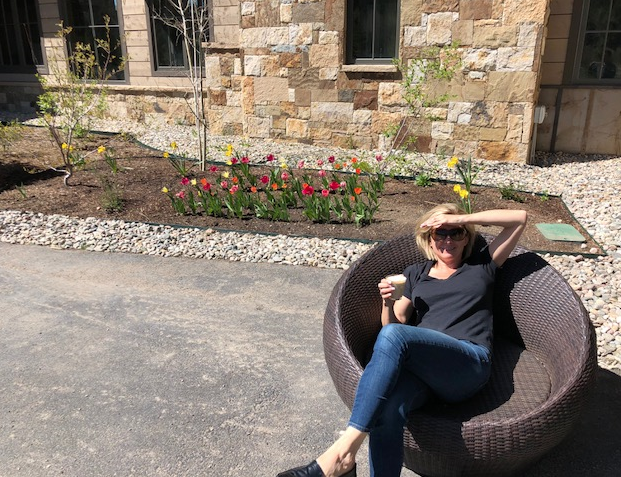 This my blog#2; occasional free commentary, less formal, free-wheeling, D&M, mixing market thoughts with what’s happening in my world and updates on our business. The big moves in the last week or two were in the EUR largely on political developments in Italy, and then Spain on Friday. Until recent weeks, the Eurozone has seemed impervious to political risks; including the Catalan separatist movement, A German government stalemate, and protracted political uncertainty in Italy. The market appeared to be doped by the novocaine provided by ECB’s asset purchases. However, for some reason, it has awoken and is demanding a risk premium again for investing in periphery Europe. Perhaps the events in Italy have made the risk of a clash between Italy and the EU more real. The market may have been stirred by broader volatility; including upheaval in Turkey ahead of the election next month. 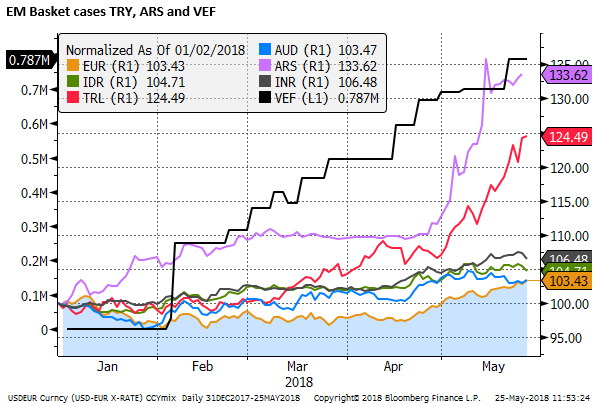 Argentina and Venezeuala markets have also been in crisis. 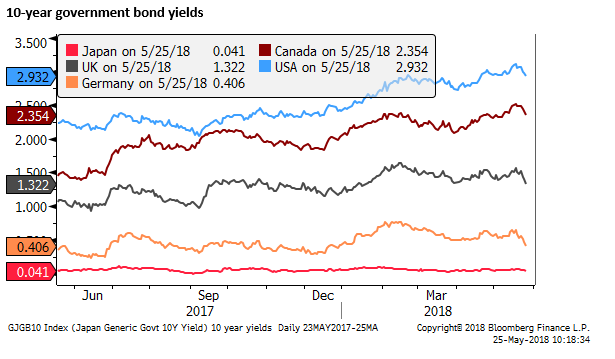 Perhaps the rise in US yields and a stronger USD have created a more risk-averse market environment that has spilled into the Eurozone. Higher oil prices may have further undermined confidence in EM energy importers like INR and added to a sense of tightening financial conditions for households and businesses globally. Perhaps the market is looking ahead to a possible end in ECB QE policy, removing the novocaine for the Eurozone. The ECB has been hinting that they will halt its QE purchases after the current program ends in September. The program itself was halved from purchases of 60bn to 30bn EUR per month since the beginning of the year. The case for a weaker EUR is that the financial market stress in the Eurozone will cause the ECB to extend its QE and delay rate hikes. However, the message received by the market is that they are looking for the exit, so it may not be as quick or as eager to extend and expand as it was a few years back. Draghi's term ends in October. Eurozone crisis has not always hurt the EUR as capital flight from the periphery went to the core, not out of the EUR. And it could be argued that if weaker periphery members pulled out, the core would be stronger. Furthermore, the Eurozone has a current account surplus and does not need to attract foreign capital for stability. The case for a weaker EUR is more generated from the economic chaos from weaker periphery bleeding to the core, forcing fiscal transfers, and monetary policy easing. 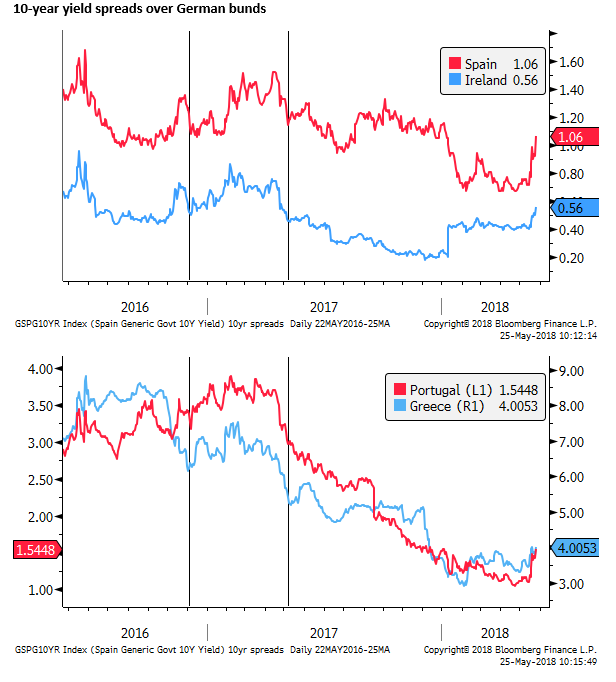 At times it has seemed that a weaker periphery would do little to move Eurozone policymakers, and thus EUR has been resilient to stress in the periphery. But the fall in the EUR in the last week probably does reflect a shift in views on the ECB. Earlier in the year, the EUR was strong because the market was anticipating an end to QE and rate rises next year. Those views are likely to be now wound back. 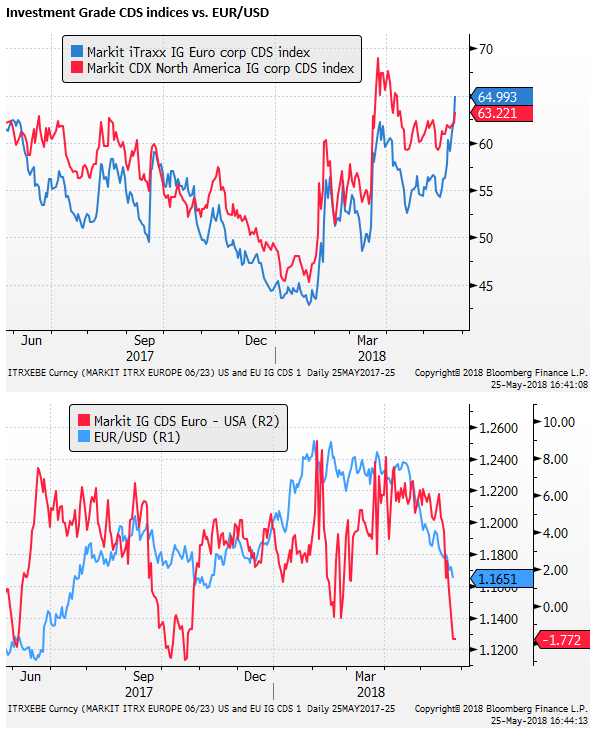 In our last Blog, we put up a chart comparing the EUR to one-year-one-year forward rate differentials. These pick up diminishing rate hike expectations in the Eurozone next year (from March) compared to the USA. 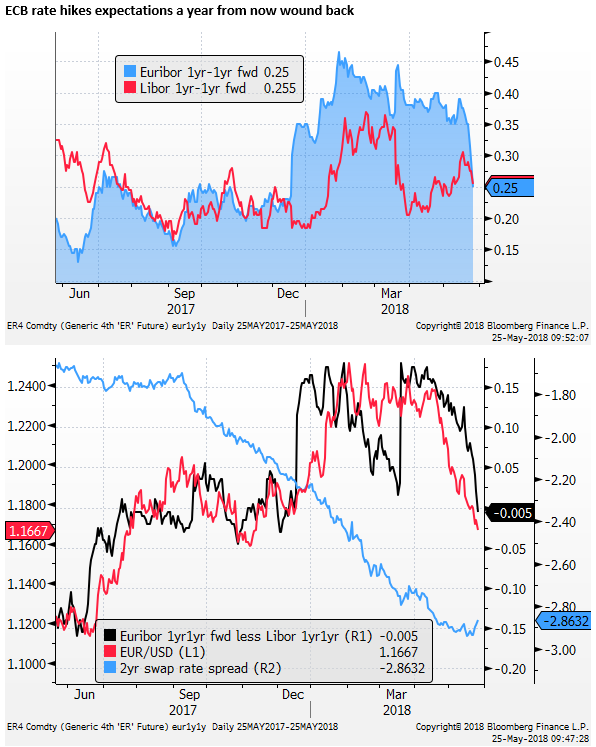 Indeed these have fallen significantly in the last week and can explain the slide in the EUR (even though the 2yr swap rate spread has actually narrowed a bit as overall rate hike expectations in the US across the next two years has declined a bit more than the Eurozone). The stress in the Eurozone is apparent in the wider 10-year periphery bond spreads. Below is the chart we used in our note this week discussing risks in the EUR. It shows the widening spread between Italian and German 10-year government yield spreads. It also shows a little bit of France-German spread widening. 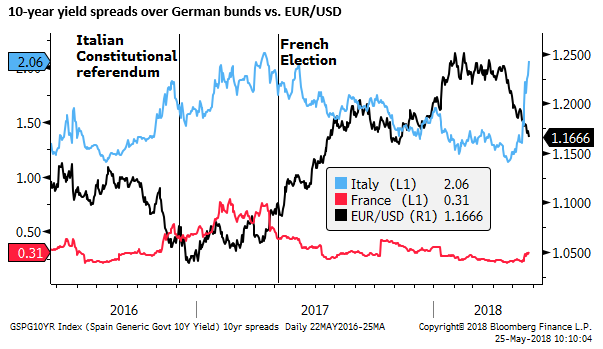 Spreads have widened to around the widest levels seen in April-2017, a time when political uncertainty was high in Italy after Renzi resigned in the wake of a failed constitutional referendum in December 2016. And on worries that a populist government led by Marine Le Pen might steal the French Presidential election in April/May 2017. We can see that the EUR was weak during that earlier period of political instability, near its long-term lows. But in retrospect, it was in a bottoming phase, poised to surge later in the year. For broader colour, the charts below show the spread widening for Ireland, Spain, Portugal and Greece. There has been broader contagion. There have been significant widening, but to levels are generally lower than in recent years. Of course, some of the at spread widening reflects lower German bond yields. 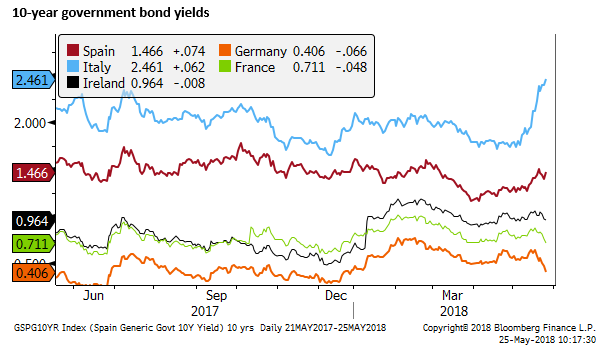 French and Ireland yields have also fallen. So arguably there is much less financial stress for the core. We can look further to find the financial stress in equities. 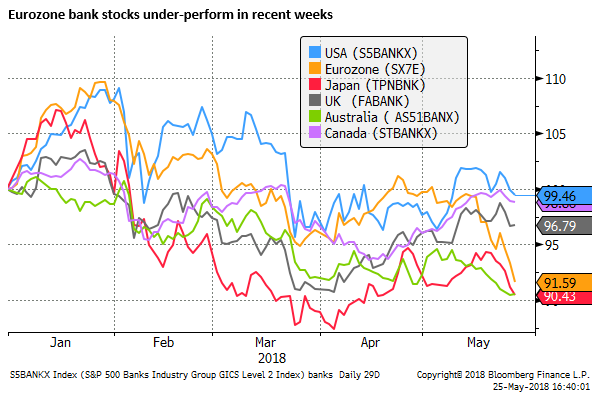 Eurozone equities have underperformed other developed markets somewhat in the last week, although not by that much, with most of the falls coming from stocks in Italy, Spain and Greece. And bank stocks in the Eurozone are fallen significantly more than other countries. And Investment Grade Corporate Bond CDS index for the Eurozone has moved above the equivalent for the USA for the first time in over a year. The fall in German yields has led falls in US Treasury and global yields. Broader risk aversion in global markets has also contributed to lower government bond yields. 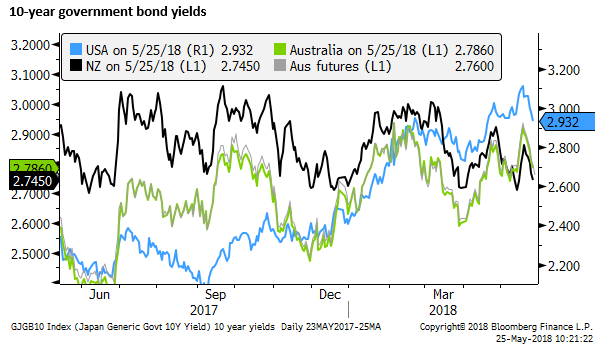 My many friends in Australia would no doubt like to see how their bond yields have reacted, and indeed that have fallen, remaining below US long-term yields. So what did I do with the EUR in the last two weeks? I was not eager to sell the EUR in the 1.17s or even the 1.18s, thinking it has already largely built in the recent weakening in Eurozone economic data. I sucked on the ECB kool-aid that temporary factors hit economic growth in Q1, and we might now start to see better reports. The weaker May flash PMI this week put this view in doubt and did not help the EUR. The stalemate in Italian politics had been around since the March election, so I was not that focused on it. I also thought that we might start to see better global investor confidence as the US and China were making concessions in their trade negotiations. In which case, the USD itself might broadly retrace some of its recent gains. I was still not convinced that EUR/USD would fall much, trading into a support zone, and I thought that if there was some risk aversion, JPY might strengthen. So I chose to sell EUR/JPY. Unfortunately, the initial reaction in US yields to the spread widening in Italy was non-existent. Instead, US yields continued to rise for the next day. This pushed USD/JPY to new highs. EUR/USD was also initially resistant to falling, finding support after its recent deep falls. So EUR/JPY went up and stopped me out of a short position. I was not confident enough in my risk aversion view on Italy to stay with the position, or re-enter a short EUR/JPY. I thought the market might revert to complacency on Italy. Indeed the new leaders in Italy toned down parts of their coalition agreement. While retaining policies that threatened EU fiscal rules, they still have some fiscal room to expand deficit spending. I feared the spread widening in Europe might be short-lived. To compound the error, I decided to re-enter my short US Treasury bond position. Eventually stopping out of that trade as US yields fell back through 3.0%; as a result, giving back the gains I had made some days earlier on a short T-bonds. In the end, the initial spread widening in Italy woke the beast, it took 24 hours to stir properly, but when it did, it added to some other factors, such as Turkey, to spread risk aversion to global yields. It is frustrating having a potentially very profitable short EUR/JPY position that was stopped out by one last push higher before cracking lower. I could be mad at the market for not reacting quickly enough. But I have to accept that I was not firm enough in my view on Italy delivering sustained risk aversion. I was right in my initial reaction, but not confident, and the trading outcome reflects this. Sometimes you get lucky when you are kind of right, sometimes you are not. In trading, being right is not enough, you have to be right and confident enough to ride the trade. Of course on the flipside, being confident but wrong, can cost your large. So what now? do you start selling EUR in the 1.16s? Well, I am not. Spanish political risk has added to mix giving the EUR another knockdown on Friday. But there is as much reason to see political risk in Italy and Spain cooling from here. The fall in the EUR in the last two weeks may have built in much of this risk. I am not that tuned into politics in Italy and Spain that I can speak with confidence on how this may play out. At the moment the market is more highly attuned to news from the region, but reading the tea-leaves is pretty murky. Trading on political risk is always a tough game. So as I mentioned two weeks ago, I thought we could start to see some recovery in EM markets. But it does appear that for some EMs the rot has set in, and they were and are vulnerable. Turkey has been the leading basket case. It was smashed after President Erdogan said in a Bloomberg interview that after the election next month he was going to take a bigger role in setting monetary policy. Markets love governments meddling in monetary policy. The Turkish central bank was forced to hike rates by 300bp to underpin the plunging lira. The other currency basket cases are the Argentinian peso and of course the Venezuelan bolivar. The later is in a full-blown currency collapse and gets its own scale in the chart below; according to Bloomberg data is down around 8000% this year. However, most other EM currencies are not down as much as the EUR in the last two weeks, and several are up. The currency market is not really about broad gains in the USD. It has been about a weak EUR; dragging on EM in Europe, and a few EM basket cases. Otherwise, EM is mixed with some gainers. So I take from this that we should be careful extrapolating from Turkey and Argentina to the rest of the EM space. European risk aversion may be feeding to and from a bit of EM weakness and dollar strength, but it is not a compelling risk-off market. We could see risk aversion cool down. We could see nerves over Europe calm down, and we could see a rebound in EUR and a fall in the USD. This is not my base case, but I see a significant risk getting sucked into short EUR positions now, or presuming that Turkey’s problems are going to spread to Asian EM. 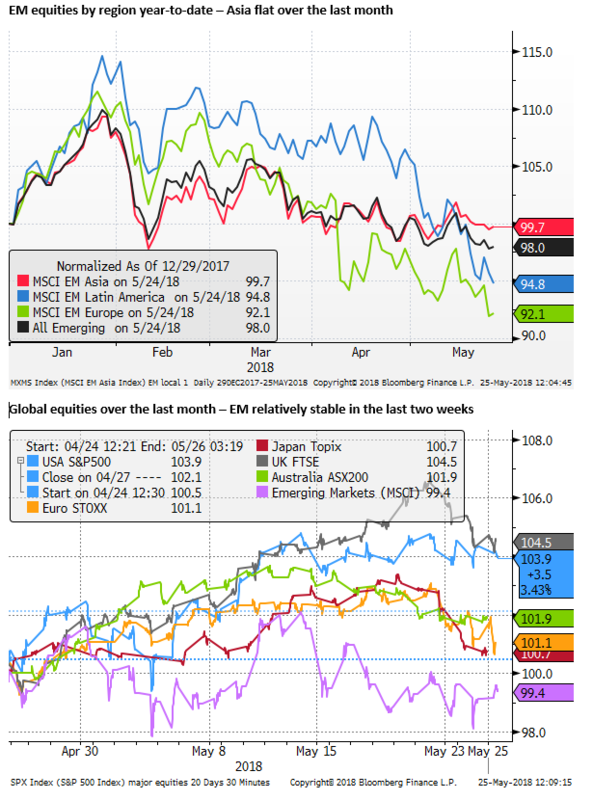 Looking back a bit further, it appeared that EM was under pressure from rising US yields and trade-protectionist fears, This week, US yields are off their highs, and this might be supporting some EM markets, and do so further in coming weeks. Trade-protectionist risks have been toing and froing and still pose a threat to EM markets. I wrote about that this week, trying to get on top of this issue. (Strident US trade policy supporting the USD; 25 May - AmpGFXcapital.com). There are a number of uncertainties that should keep a lid on investor confidence. Trump floated auto tariffs, pointing to risks for NAFTA and EU trade relations. This may be another reason to see downside risk for EUR. However, given EUR is in the dumps for other reasons, which could ease-off and cause a period of recovery, I am keeping US-EU trade risks is my back pocket as something that might help later to justify a sell from possibly higher levels. What else is happening, ummm.. oil prices fell sharply on Friday. I guess we should have seen that coming. The market has been super bulled up on oil – global inventories back to normal, Venezeuala and some others’ production sliding, bottlenecks in US shale oil, stronger global demand, Saudi’s want a high price for their proposed Aramco IPO. But it's in no one's interest to see oil fly above $80, so Saudi Arabia and Russia reminded the market that they can open their spigots. So what does a lower oil price from here mean? Higher oil prices were probably contributing to some of the risk aversion in EM and Europe, adding to upside pressure on global yields. Oil prices seem unlikely to fall too far from here. Saudi/Russia supply will be aimed more at capping oil above $80. But by reducing the fear of $100 oil, it could help global investor confidence. This is another reason to consider the risk of a rebound in EM and EUR, and retracement in USD gains. Let's get onto the Fed and US rates policy. The noises this week appear aimed at preventing a further rise in US yields. I have not personally read the FOMC minutes yet. I am planning on giving it a close reading over the weekend. But the headlines and noises from commentators suggest a bit of dovishness taking hold. Comments like “we are watching the yield curve”, “we are cool with some overshoot in the inflation target”. Another reason not to be rushing to buy USD right here right now. Geez if I keep this up, I might start to convince myself to sell the dollar. One thing we have not mentioned here is the economic data. US reports strengthened further, while Eurozone and Japan flash PMIs fell further. So it appears that there is a bit of divergence going on, with the US economy moving up on fiscal stimulus, while there is some waning in growth abroad. I think it is too early to see this as an investable theme. I am not convinced economic trends will diverge so clearly. Will they divergence enough so that the Fed is forced to tighten more than expected. The Fed minutes have the market leaning the other way. But of course, we need to be cognizant of the risk that the market is still not building in enough inflation risk in the US. Another thing on my watch list is the GBP. GBP has fallen as much as EUR in recent weeks. Weaker than expected UK inflation, a walking back of rate hike expectations over the last month, and some increase in negative political and Brexit news have combined to weaken the GBP. However, employment data was strong, and retail sales were stronger in April. Travails in Italy and Spain should not undermine the GBP. Arguably it even makes Brexit seem not such a bad idea after all. The market seems to be looking at the latest Brexit dealings with a glass half empty attitude. Progress has been made since last year, and PM May is attempting to move the negotiations forward. Negotiations are always going to look difficult. PM May is attempting to thread the needle, with everyone shouting at her and half the pavilion baying for her to fail. There is no doubt a wide risk band around GBP at the moment, so I haven’t acted on this thought-bubble. 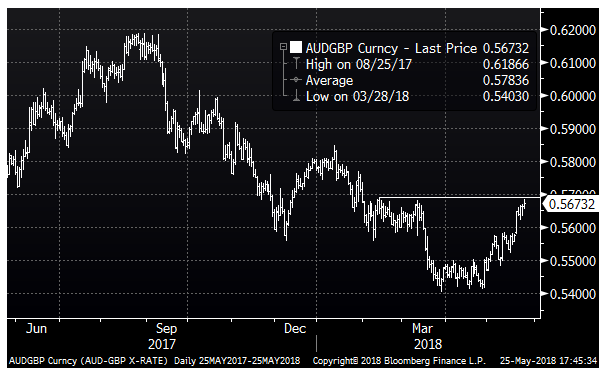 But AUD/GBP is at levels that might look OK to sell. Gabbi planted some tulip bulbs in front of the house last fall/autumn. And with the snow melted they have popped up nicely. So whats on your mind? tell me if you think I have rocks in my head. On a lighter note since you like your lattes did you know the flat white is a kiwi invention? They dont serve them in the US I think..
Look forward to your next freebie ! I have always struggled with the flat white vs latte definition. We make our own with our at home Rocket machine. I’d like to say I am consistent enough with steaming the milk to make the foam less or more than 5mm, but you get it as it comes. Sometimes I can fluke the latte art.